A pre-primary and 6th grade school girls wash their hands at the new facilities. Kratie Povince, Cambodia, September 2018 - After a long drive on bumpy, dirt roads, it’s break-time when we arrive at Serey Pheap Primary School to inspect its new water, sanitation and hygiene (WASH) facilities during a trip we took earlier this year. Prey Veng Province, Cambodia, September 2018: A football jersey is the choice of physical education wear for most of the children at Peam Ror Primary School. Variations of blue and white jerseys are worn by the students as they eagerly await the clanging sound of the school bell announcing recess. 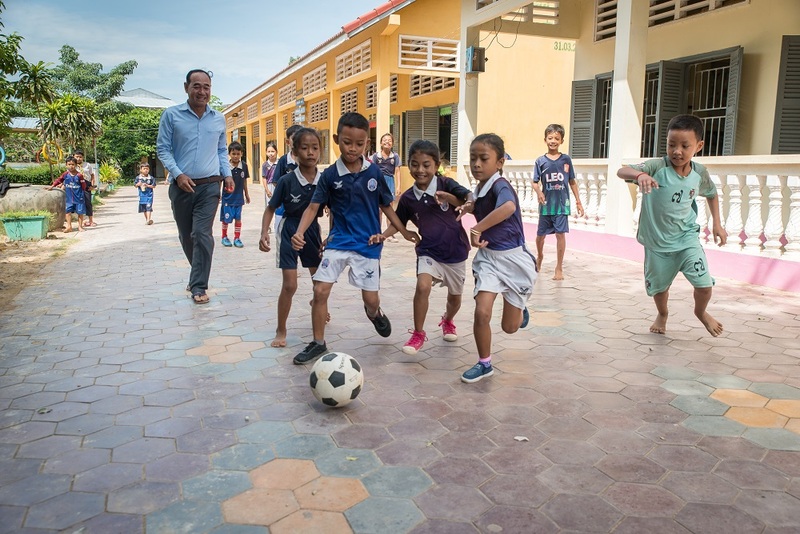 As they play a game of five-a-side, even their scuffles and ball-passes show a sign of order and discipline – a hint of the changes that have taken place in the school over the last three years.